So far so good. It's almost noon and we have made it through most of the day unscathed. Several years ago my kids realized they could outsmart me on April Fools Day. April Fools Day has always been one of my favorite days of the year since I was a kid. My best friend growing up has an April 1 birthday. My mom would make us crazy lunches whenever April 1 landed on a school day. One year I opened my lunch to find a peanut butter, sweet peas and daisy sandwich. No one could eat that. Fortunately, one of the teachers had my real lunch and I wouldn't have to eat the joke sandwhich. But there always was a joke. The Internet has taken April Fools Day to new levels. Really Google started it out with pranks every April 1 and has upped the ante every year. Here is a great article on the origins of Googles April 1 activity. A few years back my dearest daughter took up where her grandmother left off. 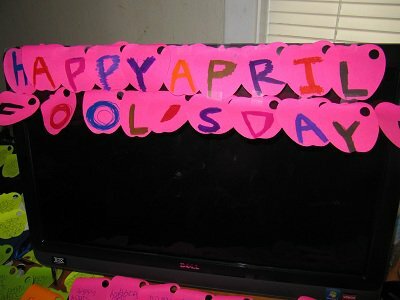 I woke up early April 1 forgetting that it was April Fools Day. I went to the kitchen and grabbed the coffee pot to fill it with water to make a pot of coffee like I do every day. Only on this day when I turned on the water it didn't come out of the spout as expected - it came shooting out of the hose that had been taped open the night before and pointed directly to the middle of the sink to maximize the amount of spray that would hit whoever turned on the water. Giggles filled the air as I squealed in surprise. So, remember to double check all of your sources when reading anything online today. And remember that its always a good idea to trust but verify every other day of the year anyway.